Here it is. The "asthma bell". A few weeks ago, our oldest son, Evan, was having a lot of trouble with wheezing, coughing, and some shortness of breath. His inhaler had run out and I was searching through the medicine cabinet for anything that might give him some relief. I came across some Prednisone pills and set them on the kitchen counter with a note for him. I went on to bed, but then sat up, worried. My husband's sister has severe asthma and has almost died during asthma attacks. I knew my son's asthma was NOTHING like that, but it suddenly occurred to me that I had seen a bell in the kitchen cabinet. 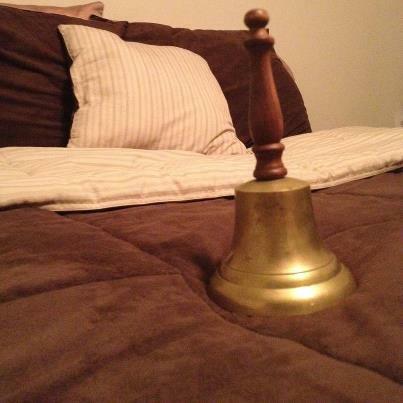 (No, I have no idea why a bell was in my kitchen cabinet) So, I went downstairs, found the bell, and set it on his bed. I figured that if he really ran into some severe problems with asthma during the night - however unlikely that may be - then he could just ring the bell. I mean, what if he woke up, gasping for air and he couldn't even walk to our bedroom? I have a very dramatic mind. But I knew I would sleep better if there was a plan. Isn't that what we mothers are for? Yes that's what mothers are for. Our son had asthma very badly when he was little. He has mostly outgrown it, thank goodness. We used to be scared at night just like you. What's really scary is when the house gets quiet and you realize you can hear them wheezing. Yikes! I'm so glad he has mostly outgrown it. Our son hasn't had it severely as his aunt has, but it is scary all the same. Thanks for stopping by! Blessings! Love this post, Kathy! Hope no one ever needs the bell. Actually, we rigged up a similar situation after my son's open-heart surgery. I stayed with him every night in the hospital. The first night at home, I slept on the floor beside his bed. After that, I needed to sleep in my own bed, but I was anxious. . . so I had him keep his cell phone on the table beside his bed. When he needed me, he called our home phone number--and the phone right beside my bed rang! Kind of a new-fashioned "bell"--but it sure worked! I totally get it. I would have done the same. Thanks, Richella! Yes absolutely! My son is 23. He had severe asthma when he was growing up. The bell makes complete sense to me because if you are really struggling to breath you can't call for help. Thankfully my son has very little trouble with it now. I feel for Evan. He's doing well at the present time, but no matter how old they get, you still worry. Thanks for writing, Stacey! Making a Cake Mix Special!